A couple of short vids for all you trainiacs out there. Just a couple of vids taken about 3 blocks from my house. Our old abandoned Illinois Central train yard in McComb, MS. The first vid shows just a little of train yard and the second shows our static steam locomotive display we have at our IC historical museum. Enjoy! Re: A couple of short vids for all you trainiacs out there. Great shots Bal. your taking all the surprise out of my visit though. hehe, wait till you see the musuem! In the showcase photos about 14 seconds in. What can you tell me about the flat faced "whatever". I love researching anything oddball or ugly. The "Eagle calender" is very cool too. Anyone ever produce it in scale. It would make a killer custom. Cant think of a bicentennial I like more, and I do like bicentennials. Reminds me of the sharkfaced WWII fighters. Wish I would have seen that engine when it was like that. development of that train station and museam. The collection is priceless!!! Anytime! Hopefully you will get down here to see it first hand! GG1, I will go down and find out what I can for you..it probably is a custom made job would by my guess..i think i did see one of the eagles done in HO. I'll look around for that one as well and see what I can dig up. ah...well, if you want to be savy you can get the ho scale decals and then go scan them up to size and then print them out on a new sheet of laser printer decal sheet. ta daaaaa problem solved! =) any print shop should be able to do this for you or help you at least. 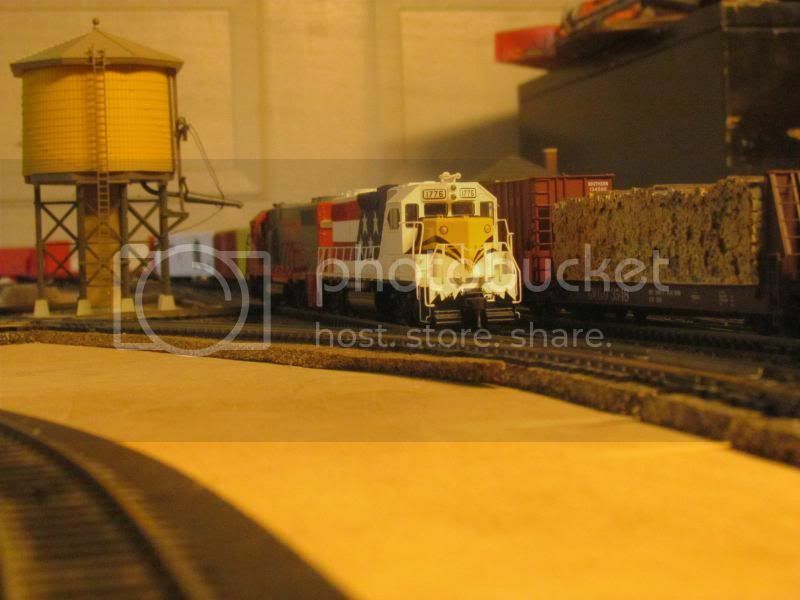 Come to find out one my other IC friends has this Athearn engine! thought you would like the pic! I'm told they make an appearance on ebay all the time. I'll probably go the print route as I only have a small hoop of ho intended for eventual "narrow gauge line". Let me know if you find out about that other "thing" from the showcase the next time you make it inside the museum. If you are talking about that piece of metal at the bottom of the shelf it appears to be some kind of spike as there are two little ones with it. Either that are a piece of a tool to remove spikes. Those logs piled up on the flatcar next to the engine, did you cut those yourself? ?